Karthika Menon, better known by her stage name Bhavana, is a popular actress in Mollywood, who has appeared in South Indian films. 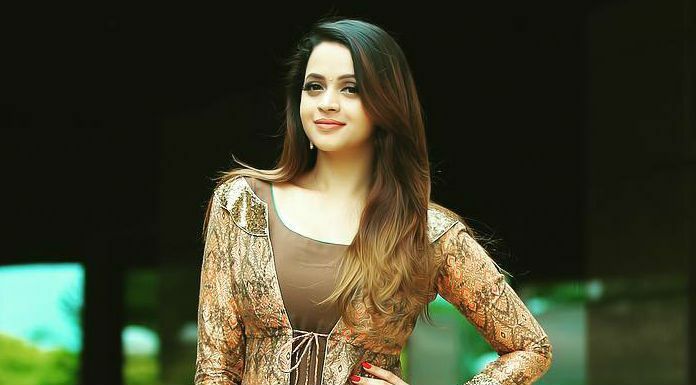 Bhavana took acting career when she was 16 by playing a supporting role in a 2002 Malayalam film Nammal, which earned her appreciations and awards. She subsequently has acted in more than 60 films till date, mostly in Malayalam followed by Tamil Telugu and Kannada. She has won acclaims and awards for her contribution to cinema, including two State awards, one Filmfare South among others. She was born on June 6, 1985 in Thrissur, Kerala, India. She attended Holy Family Girls’ High School in Chembukkavu, Thrissur. Naveen – She has been dating Kannada film producer Naveen for many years now and they got engaged on March 9, 2017 and married on January 22, 2018. Bhavana wears a show size US (7). She wears a dress size 4 (US). She first appeared in the 2002 Malayalam film Nammal alongside Siddharth. She received Kerala State Film Special Jury Award and Aisanet Award for Best Supporting Actress for her work in the film. Bhavana made her Tamil debut with the 2006 film Chithiram Pesuthadi starring alongside Narain, and played the role of Charu. She made her debut in Telugu and Kannada with the 2008 film Ontari and 2010 film Jackie, respectively. She hasn’t appeared in television series except promotional talk shows. She is well knwon for her role Sameera in 2005 Malayalam film Daivanamathil. She has a couple of cars such as a Tata Nano and a Jaguar XJ. She lives with her family in a luxury traditional house in Thrissur, Kerala, India. Bhavana has a net worth of $3 million US dollars as of 2017. She takes 40 – 50 lakhs per film and is one of the highest paid actress in Mollywood. Bhavana is one of the popular actresses in the south thus winning the likes of million of people, thanks to her charming looks, bubbly smile and attractive eyes. Inspired to become an actress at her early age, she used to imitate her favourite scenes from movies in front of the mirror. She even broke her arms while trying to imitate actress Amala from the Malayalam movie Ente Sooryaputhrikku. She is bets known for her role Sameera in Malayalam film Daivanamathil. Apart from doing films, Bhavana is also a brand ambassador of numerous products and brands, including the Textile giant in Kerala Pulimoottil. She is also the brand ambassador for the celebrity cricket league franchise ‘Kerala Strikers’ along with actress Mamta Mohandas. Not long before, Bhavana hit the headlines of every news channel for all the wrong reasons. The actress was abducted and allegedly raped in a car by a group. Police had nabbed them. Many form film fraternities came in support of her at her bad times. Bhavana is currently engaged to her long time boyfriend and film producer Naveen on the 9th of March 2017. Their marriage is likely to happen shortly. Bhavana is also a trained dancer.